Venezuelan opposition leader Juan Guaido, who many nations have recognized as the country's rightful interim ruler, talks to the media at a news conference in Caracas, Venezuela, April 2, 2019. 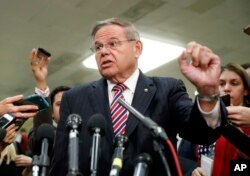 Sen. Bob Menendez, D-N.J., speaks to members of the media after leaving a closed door meeting about Saudi Arabia with Secretary of State Mike Pompeo, Nov. 28, 2018, on Capitol Hill in Washington. 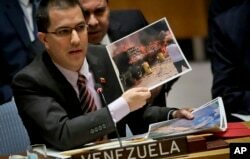 Venezuela Foreign Affairs Minister Jorge Arreaza shows pictures he said represent opposition members initiating violence during a meeting on Venezuela in the U.N. Security Council at U.N. headquarters, Tuesday Feb. 26, 2019.